OBJECTIVE: In-vitro setups are standard during device development and regulatory approval of transcatheter therapies nowadays. 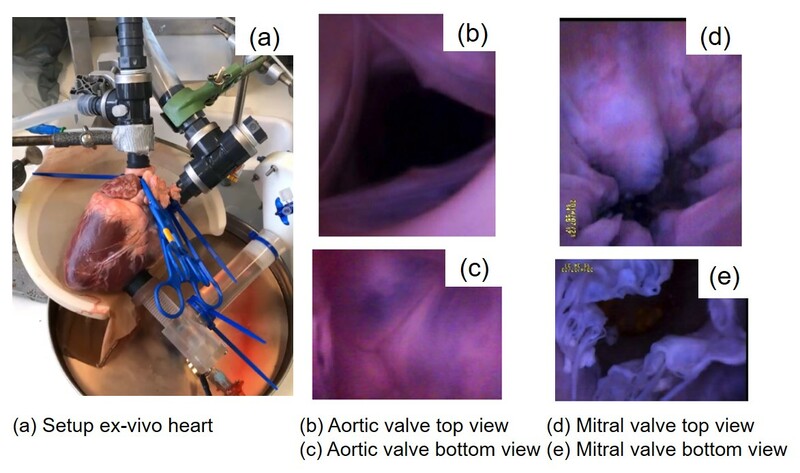 These bench-tests, however, lack the anatomical similarity required for several of the newly developed devices aimed towards repair and replacement of the heart valves. The proposed ex-vivo simulator aims to bridge a gap between in-vitro and in-vivo setups, combining anatomical similarity with physiological flow and pressure properties. METHODS: The apex of the right or left side of a porcine heart is connected to a linear drive, tubing and a reservoir to form a circulatory loop. Compliances and resistances are added to allow for more physiological flow and pressure signatures. Pressure transducers monitor the pressure at the ventricles, the atria and the pulmonary artery or aorta. The cardiac output is measured after the outlet valve. RESULTS: Pressure and flow curves of the simulator are comparable to physiological values. Access ports at the ventricle, the atrium and the outflow allow for insertion of catheterbased devices to practice, teach and test their application through different access routes. An endoscopic camera can additionally be introduced to visualize the procedure or the deployed device in-situ. Echocardiographic assessment can be used for further investigation of the inside of the porcine heart. CONCLUSIONS: The passive beating heart platform is a cost-effective and user-centric in-vitro bench test, suitable for the application of catheterbased therapies in an almost physiological environment. It aims to fill a gap between in-vitro laboratory and in-vivo animal studies at a reasonable time and cost efficiency.